As the world marks August 30, the International Day of the Disappeared, we are reminded that forced disappearances and transitional justice share a common history. Indeed, processes working in concert that came to form the field of transitional justice were born from the search for truth and justice about the disappeared. The story begins in South America: dictatorships- exemplified by military juntas in Argentina and Chile- employed forced disappearance in an attempt to silence and control political opposition. Individuals were snatched off the street, dragged from their bed in the middle of the night, or pulled from a protest crowd. Most were never seen again. Authoritarian power had often withheld records of any kind from the public for decades, but the relentless demands for truth could not be ignored. Truth commissions were established to produce a historical record of the conflicts, and document the testimony of families torn apart by disappearances and other abuses. These truth-seeking processes became models for countless other countries. The pursuit of criminal accountability for forced disappearances was never easy: those ultimately responsible for policies of disappearances were often senior security and military officials, and high-ranking architects of these policies usually take care to obliterate any record of the abductions in an attempt to erase their responsibility. "International and domestic courts across the world have brought to trial perpetrators who have ordered or carried out disappearances as a tactic of terror or a gruesome tool of war"
However, significant advances have been made since the breakthrough in 1988, when the Inter-American Court of Human Rights found the government of Honduras responsible for the disappearance of Manfredo Velasquez, a student leader who was disappeared by security services. More perpetrators were brought to account as amnesty laws that once protected perpetrators were overturned. Though Augusto Pinochet died before the conclusion of his trial, he was indicted in 2004 for his role in kidnapping and disappearances in Chile, and senior Argentine police office Miguel Osvaldo Etchecolatz was convicted and sentenced to life imprisonment for his role in kidnappings. International and domestic courts across the world have brought to trial perpetrators who have ordered or carried out disappearances as a tactic of terror or a gruesome tool of war. In the most recent example of such a conviction, last week senior Guatemalan police official Pedro Garcia Arredondo was found guilty of war crimes for his role in abductions during the 1960-1996 war. Confronting the impact of disappearances on a society clearly defines the principles of truth and accountability that drive the practice of transitional justice: to move forward, you must reckon with the past. Transitional justice helps societies comprehensively address legacies of disappearances by establishing the records of the disappeared, seeking criminal accountability for those responsible, restoring public trusts in institutions, and issuing reparations to the families of the disappeared. On this International Day of the Disappeared, ICTJ joins its partners in reaffirming that forced disappearances are a fundamental violation of basic human rights and of international law. Forced disappearances must be publicly condemned whenever they occur, and arguments in their defense rejected. The architects of such policies must be held accountable, and systems of impunity shrouding the practice in secrecy should be dismantled. To mark this day, ICTJ reflects on three countries where we work in partnership with communities to address legacies of disappearances through transitional justice measures: Nepal, Lebanon and Cyprus. Nepal’s decade –long conflict from 1996 to 2006 left enormous suffering in its wake. 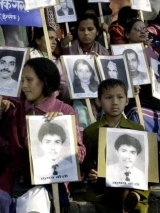 Between 2003 and 2004, according to the UN Working Group on Enforced and Involuntary Disappearance, the highest numbers of reported disappearances in the world were in Nepal. Instances of enforced disappearance dramatically increased after 2001, when the government deployed its army to conduct counter insurgency operations against Maoist fighters. However, forced disappearances weren’t uniquely integral to government campaign: Maoist insurgent forces were also responsible for enforced disappearances against perceived informers, or “enemies of the revolution.” In response to international and national pressure to respond to the legacy of disappearances, the Nepali State established investigation committees to determine the whereabouts of the disappeared. The first probe committee was formed in July 2004 in response to a hunger strike organized by the families of the disappeared. The Committee published the whereabouts of a total of 320 persons, but did not list any names of perpetrators and stopped short of prescribing any substantial legal action. The judiciary first investigated disappearances in 2006 through the establishment of the Detainee Investigation Task Force. In August 2007, the Supreme Court of Nepal issued a mandamus directing that the government provide compensation to 83 families of persons who were subjected to State-enforced disappearance, promulgate an Act criminalizing enforced disappearances and form a commission to investigate and prosecute those responsible. In spite of these initiatives and actions by the judiciary and executive, there has been no prosecutorial action on disappearances to deal with this crime. ICTJ has been actively engaged in legislative advocacy on legislation dealing with disappearances. In 2008, ICTJ submitted its comments to the Ministry of Peace and Construction on various versions of the draft Bill on Enforced Disappearance (Crime and Punishment) 2008, and has called for the bill to meet international standards. ICTJ submitted its comments on the Disappearances Ordinance introduced unilaterally by the Maoists. Additionally, ICTJ has provided its expertise on reparations to the Ministry, and continues to closely monitor developments on truth and accountability for the disappeared. Despite the formal end of its successive wars in 1990, Lebanon has not seriously addressed the issue of the missing and enforced disappearances. The fate of thousands of victims remains unknown, and their families do not know their whereabouts. About 17,000 persons are reportedly missing and several mass graves have been identified since 2005. In February 2012, associations of families of the disappeared proposed a Draft Law for the Missing and Forcibly Disappeared Persons. Based on the fundamental right to the truth recognized in international standards, the law proposes the formation of a national institute to investigate the fate of the missing and the disappeared. The Committee of the Families of the Kidnapped and Disappeared in Lebanon and Support of Lebanese in Detention and Exile (SOLIDE) finalized the draft after consultations with local and international non-governmental organizations including ICTJ, as well as legal and forensic experts, activists, judges, and jurists. ICTJ has been extensively involved in consultations focused on the proposal of the draft law and has co-hosted a roundtable in February 2012 to further discuss the prospects of the law, developing an advocacy and lobbying strategy, and generating increased public discussion on the issue. In fact, this journey began in June 2010 when the Center, in partnership with Friedrich Ebert Stiftung, organized a four-day visit to Bosnia-Herzegovina for 15 Lebanese advocates including judges, parliamentarians and ministry representatives, NGO activists and families of the missing. Following the visit which provided an insight into the Bosnian experience in the search for the missing, a legal committee began to discuss concepts for a draft law that would be appropriate within Lebanon’s legal system and reflect the families’ demands. Earlier in 2009, ICTJ had been engaged in an extensive research on strategic litigation on “the right to know.” Its efforts contributed to a decision by a Beirut judge to allow the families of the missing to have access to an unpublished 2000 report on the disappeared. Despite the overwhelming silence of the government, one recent effort in April 2012 parliamentarians and the Minister of Justice drafted a decree to establish an independent national commission for the victims of enforced disappearance. However, the decree has not been adopted and the fate of thousands remains unknown. Displacement, disappearances, and long-standing division have afflicted Cyprus for decades. Over 1,000 Greek Cypriots and hundreds of Turkish Cypriots were disappeared in Cyprus during the violence of the 1960s and 1970s. In 1981, the UN established the Committee on Missing Persons (CMP), charged with investigating all cases of missing persons related to the conflict. As of February 2011, the CMP had retrieved the remains of more than 760 individuals and identified and returned remains of 263 persons to their families. ICTJ has worked in Cyprus from March 2009, with the goal of helping civil society and victims’ groups address the island’s violent past. Exhumations of mass grave sites and memorials for the disappeared have been held. However, educators wishing to address the past in the classroom have lacked the adequate tools to teach their students about disappearances. Through links, film segments, newspaper clippings, the education pack seeks to promote historical thinking by applying the skills and concepts of history education to the issue of the missing persons. Skills and concepts from the discipline of history teaching help teachers and approach the emotionally charged issue of the disappeared. PHOTO: “Disappeared” exhibition at Donostia Kultura, by the prestigious photographer Gervasio Sánchez. Photo by Iñigo Royo.